Why Would You Not Use #Lanyrd For Your Event? I’m a fan of Lanyrd, which is described in Wikipedia as “a conference directory website created by Simon Willison and Natalie Downe and launched in 2010“. The article goes on to add that “The site compiles blog posts, photos and other coverage from events and keeps it organised by session and speaker. Users on the site are identified through the Twitter API and events are shown to users based on their contacts on Twitter“. Lanyrd was released in September 2010 and I started to make use of it shortly after its launch and have been a fan ever since. We have set up a Lanyrd entry for UKOLN’s forthcoming IWMW 2012 event. This provides a calendar view of the programme (which can be exported in various calendar formats), But perhaps of most interest is the social dimension to the service. As can be seen you can view the speakers at the event. 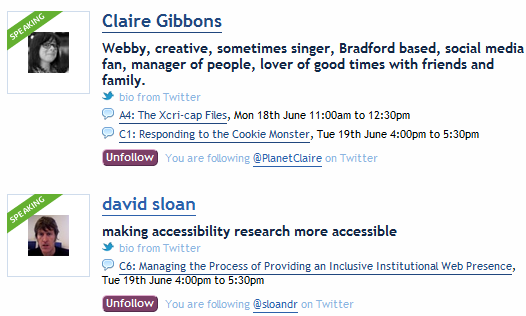 Since the speakers are identified by their Twitter ID, once you have signed in to the service you can quickly see the speakers who you follow on Twitter or, if you aren’t currently following them, you can choose to extend your professional network by following them. The service isn’t just for speakers, facilitators and organisers at an event, however. If you are attending an event you can register as a participant. If you are merely interested in the event you can also register your interest in the event by tracking the event. Lanyrd has developed since its launch, and there are now dedicated Lanyrd apps available for the iPhone/iPad and Android devices. In addition there is also a mobile interface to the web site available which can be used if you haven’t installed an app or an app is not available for your mobile device. But in addition to Lanyrd’s potential for forthcoming events, it can also help to provide a better understanding of an event over the years, including the speakers, participants and the content. A Lanyrd guide (a collection of related events) has been set up called IWMW which provides details of all 16 IWMW events since its launch in 1997. The entries for the early years (currently) provide details of the title of the event, the location and the dates. But in addition, the abstracts for plenary talks and workshop sessions together with speaker details for events held since 2006 are also available. 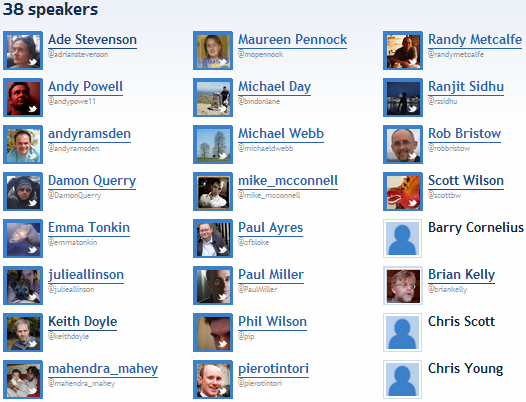 As can be seen we have provided speaker details going back to IWMW 2006, which, as you will see if you view the list of sessions held on Lanyrd, was the start of interest in Web 2.0 across the UK higher and further education sector. We also made use of Slideshare for many of the plenary talks given at the IWMW 206 event (although these may have been uploaded after the event was held). And since Lanyrd supports embedded objects includes slides and videos, we have been any to facilitate access to the slides (and, in one cases, accompanying videos) for the plenary talks. Provide a better understanding of the speakers and facilitators who have contributed to the event over the years. Help to raise the profile of the speakers and facilitators. Enhance participants’ memories of the events. Yes, an API is in the pipeline. If you are interested in receiving announcements and updates about the API, you can join our API discussion mailing list. As a conference organiser I’ve an interest in developing the APIs for Lanyrd guides. 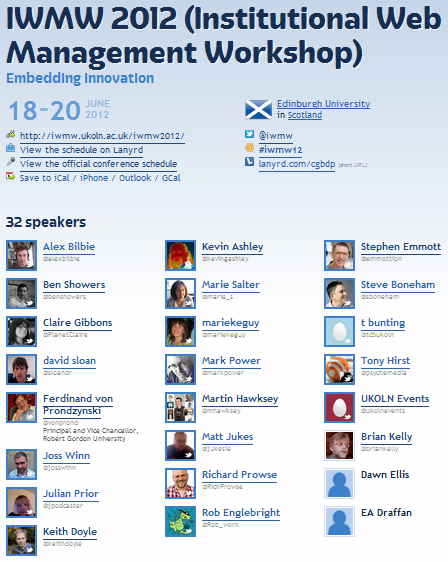 For the 16 IWMW events it would be useful to be able to display information on the numbers of speakers across all events, the numbers of times they have spoken. In light of the recent post which asked Are There Too Many Male Speakers at Events? it might also be useful to be able to provide statistics on gender balances, although I appreciate there are sensitivities with such questions. But perhaps the most useful aspect of Lanyrd would be gained if participants at previous events used Lanyrd to list the events they have attended. This would help to give an understanding of the participation at events, beyond the speakers. Such information is clearly personal and would be covered by Data Protection Legislation. But if individuals were to provide such information for themselves that would overcome privacy concerns. We tend to focus on using technologies to enhance forthcoming events. I wonder whether there may be value to be gained in data-mining the wide range of events held in the higher education sector over, say, the past ten years. Any thoughts? This entry was posted on 15 May 2012 at 10:55 am	and is filed under Events. You can follow any responses to this entry through the RSS 2.0 feed. You can leave a response, or trackback from your own site. I’m reluctant to use Lanyrd as it requires the use of Twitter as identity provider. Twitter OAuth isn’t really set up to do this i.e. there’s no option that just says to an external app “Yes, I confirm this is the owner of this Twitter account”; rather, it is set up to provide external apps with varying levels of access to functions on my Twitter account. I’d happily use it if it supported, say, OpenId. Hello Pete, we have just launched an update which now uses read-only permissions on Twitter to access Lanyrd http://lanyrd.com/blog/2012/twitter-read-only/ I understand why you are keen on OpenId, though having Twitter as our initial identity provider allowed us to bootstrap the site off existing social graphs.